Every so often I find a self-help or mind, body, spirit book has turned up in the post for me to review that I don't remember asking for - always a pleasant surprise. 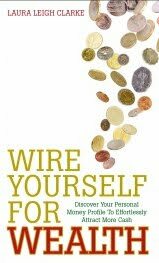 Last week, I unexpectedly received a copy of Wire Yourself For Wealth: Discover Your Personal Money Profile to Effortlessly Attract More Cash by money coach and business consultant Laura Leigh Clarke. In the publicity material that came with the book, Publisher Hay House said: "Have you ever wondered how some people just seem to be wired for wealth, while others spend their whole lives struggling for money? In Wire Yourself for Wealth Clarke shows precisely how to cut through the noise so you can wire your true self for wealth, no matter what you think you've ‘failed’ at before. She explains that unless you're making the kind of money you are happy with, your Money Genius has not yet been given the power to unleash your true wealth potential into your life." To be honest, I could do with earning a bit more money right now. Last summer, after taking voluntary redundancy from a job as a sub-editor on a financial newspaper, I decided to become a self-employed writer and copy-editor. Despite the generally difficult economic climate, I've managed to get quite a bit of work and am generally busy. However, I'm certainly not getting rich. At the heart of the book is a system to help you work out a profile of the kinds of money-making activities you excel at - what it calls your Money Genius type - so you can create and attract wealth more easily. The advice in Wire Yourself For Wealth has certainly given me ideas to mull over and I think the book could be useful reading for anyone who wants to set up their own business.